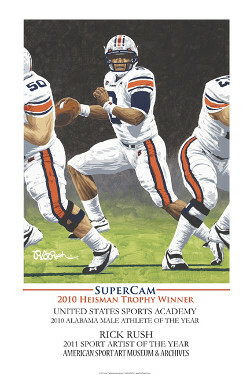 Before Auburn senior kicker Wes Bynum cleared the uprights as time expired and the engraving process for the Tigers’ BCS Championships rings began, the United States Sports Academy honored quarterback Cam Newton with the 2010 Alabama Male Athlete of the Year Award. 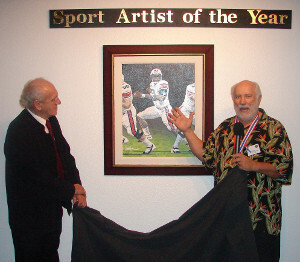 To commemorate this award, the 2010 Heisman Trophy winner was honored by way of the paint brush of Rick Rush of Tuscaloosa, known as “America’s Sport Artist.” Rush, the 2011 American Sport Art Museum and Archives (ASAMA) Sport Artist of the Year, Painter, unveiled his masterpiece of Newton at an art show on the Academy’s Daphne campus on 6 January. The painting has now been released as a limited-edition poster, which is available at the Academy’s bookstore for $50. Versions autographed by Rush are available for $100. They can be ordered by logging on to www.ussa.edu/bookstore. Newton was named Alabama Male Athlete of the Year by the Academy in December. In his first regular season as a starter for Auburn, Newton completed 67.89 percent of his passes for 2,254 yards, 24 touchdowns and six interceptions, a passer rating of 185.57 (No. 2 in the nation). He carried the ball 228 times for 1,336 yards (111.33 average per game, No. 11 nationally). He followed that by becoming the third Tiger to win a Heisman Trophy and led Auburn to it second national championship (first in 53 years). In the BCS Championship Game in Glendale, Ariz. Monday night, Newton directed a 75-yard scoring drive in the final 2:33, ending with a field goal as time expired to give Auburn a 22-19 victory over Oregon. Newton took over the starting quarterback role at Auburn after transferring from Blinn (Texas) Junior College, where he threw for 2,833 yards and 22 touchdowns, and ran for 655 yards and 16 touchdowns in a season that ended with a national junior college championship. He spent one year at Blinn after transferring from the University of Florida. The Alabama Athlete of the Year award is given to an athlete beyond the high school level who was either born in, is currently playing in, or has previously participated in sports at any level within the state of Alabama.